This striking aurora image was taken during a geomagnetic storm that was most likely caused by a coronal mass ejection from the Sun on May 24, 2010. The ISS was located over the Southern Indian Ocean. Full Story. Thisstory was updated at 12:45 p.m. ET. Achingto see the dazzling aurora displays that make up the northern lights, but can'tget to the Arctic Circle to see them? Don't worry, a new Internet show has youcovered. 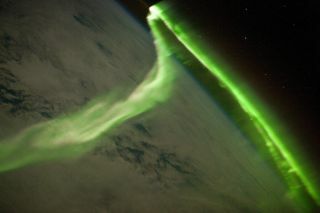 "Armchairskywatchers everywhere can now discover the wonder of the northern lights liveon their home computer screen," space agency chief Steve MacLean saidin an announcement. "We hope that watching the dance of the northernlights will make you curious about the science of the sky and the relationshipwe have with our own star, the sun." TheCanadian Space Agency teamed up with the University of Calgary, the skywatchingpublication Astronomy North and the city of Yellowknife, which is about 318miles (512 km) south of the Arctic Circle. According to the city's website,Yellowknife is "known for our outdoor recreation, midnight sun, auroraborealis and an unusual blend of northern culture." TheAuroraMAX website will include tips on how to observe auroras, explanations onwhy they occur, and highlight Canadian research into the relationship betweenthe sun and Earth that leads to the dazzling sky shows. Photo galleries andvideos of the phenomenon will also be included. A recap of each night will bebroadcast on the following day. Aurorasoccur whencharged particlesfrom the sun are funneled toward Earth by the planet's magneticfield and collide with the upper atmosphere near the poles. They are moreactive when the sun's activity peaks during its 11-year solarweather cycle. The sun is currently entering an active phase of its presentcycle, soastronomers expect the northern lights to be more common and more dazzling overthe next couple of years. Inaddition to the aurora borealis in the north, the South Pole region alsosees its own aurora displays, called the aurora australis. InCanada, the peak of the aurora season typically runs from late August to May,because the nights are longer. The auroras themselves occur all year. "Thereason we classify August through May as the 'aurora watch' season is becauseof the extended number of 'dark' hours in Canada," aurora researcherEmma Spanswick of the University of Calgary told SPACE.com in an e-mail. "From aninstrumentation perspective, the cameras we use to observe the aurora (like theAuroraMAX camera) are very sensitive. They are only able to operate when thesun is at least 12 degrees below the horizon … and in Northern Canada,that only happens between the months of August and May." TheAuroraMAX observatory will broadcast views of the northern lights through thesun's peak activity period, called solar maximum, which is expected in 2013,researchers said.